Happy Friday everyone! This is Shelley Gray from Teaching in the Early Years. Are you looking for a fun way to integrate multiple subject areas into one engaging lesson? 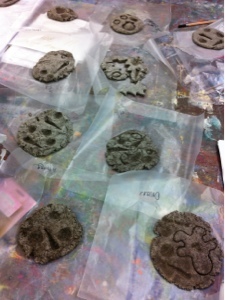 How about making fossils with your students? This is a very simple recipe and can be used by a wide variety of grade levels. Then have students roll the dough into balls and press down to create a flat surface. I usually have students bring in their own artifacts from home to fossilize, but you may want to have some spare cookie cutters, sea shells, etc available for students who forget, or who need something a bit different. As the fossils dry, the artifact's impression will become remain darker than the rest of the fossil, making it more visible to see. I recently did this project at a conference that I presented at, along with many other ideas for integrating Social Studies into other curricular areas. If you would like to view some of the other ideas, as well as ways to integrate them, please see my blog post by clicking here or on the picture below.